The January long range outlooks were released two weeks ago. The main themes are continued similar overall pattern is expected into February and possibly into spring. Colder conditions are more likely in the northern plains with no strong indications on precipitation except for some increased chances in the Ohio Valley. A new report on farmer perspectives on climate and agriculture, gathered in a 2012 survey of nearly 5000 farmers from 11 Corn Belt states, presents survey results by watershed. The survey was conducted in partnership with the Useful to Usable (U2U) project (www.AgClimate4U.org), another USDA-funded climate and agriculture project. 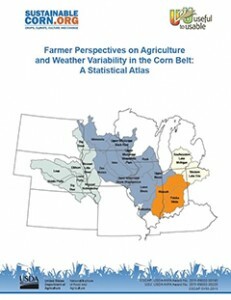 The watersheds that were surveyed account for more than half of all US corn and soybean production. Farmers selected for the survey were those who grew corn and who had more than $100,000 in gross farm income in 2011; these larger-scale farmers cultivate approximately 80 percent of the farmland in the region.